We all have movies we are obsessed with as children. For me, it was STAR WARS. Star Wars the movies, the toys, the computer games, the novels...TRON passed me by. Not so for a generous of incipient sci-fi freaks and computer nerds, not to mention Daft Punk. For those kids, TRON the movie and even more so, TRON the arcade game, are nostalgia-inducing, iconic, pop-cultural artefacts. So, the other night I Sky-plussed the original 1982 movie and finally sat down to watch a movie, loaded with the baggage of knowing that it was iconic, and the slightly odd recognition from having watched TRON: LEGACY on preview earlier in the day. The movie felt familiar and strange - archaic and modern - technical and emotional - all at the same time. I had a truly great time watching it, and while the visual effects might seem old hat today, the sheer beauty and austerity of the design is still impressive, nearly thirty years later. The plot is simple but works on two planes - reality, and within the grid - with the same people fighting the same battle in both worlds by means of avatars. In the real world, ruthless Dillinger has plagiarised the work of talented computer programmer Kevin Flynn and then forced him out of Encomm. Now, he is being blackmailed by the Master Control Programme he created to run the company. MCP, like HAL, thinks Programmes are superior to Users, and is hacking military computers to gather programmes. Flynn's friend and fellow programmer has, thankfully, created a security programme to patrol MCP, called Tron, and when MCP ruthlessly lasers Flynn INTO of the grid, using another friend, Laura's super-gadget, he will be helped by their avatars, Tron and Yori, to defeat the evil MCP/Dillinger. Everything about the film must've seemed amazing and pioneering at the time. Just the fact that writer-director Steven Lisberger thought that the guts of a computer would be an interesting place to set a film would've been radical, decades before MATRIX. And while he didn't have CGI, the way in which he mashed up live action, painted animation, roto-scoping, and good old visual effects is quite superb, and still visually striking. And no wonder, when you realise that the creative vision was the result of collaboration between Meobius and BLADE RUNNER's Syd Mead. It's thanks to them that we get the iconic grid structure, light-cycle races, uniforms and discs. 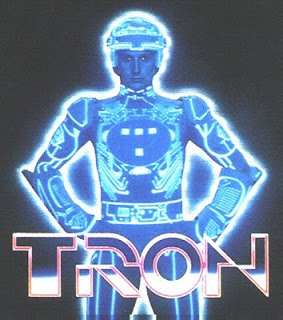 But the key strength of TRON - the reason why we still love it - is that the technical wizardry isn't all their is to it. Steven Lisberger and Bonnie MacBird have created characters we empathise with - whether it's the youthful enthusiasm of Bridges' Flynn, or the love story between Tron and Yori, or the most moving scene in the film which - radical at the time - involved the death of what is basically a computer programme. So, for me, TRON has it all - visual purity, radical creativity, pioneering technology, but always, most importantly, real heart. I can't believe I waited this long to watch it! TRON was released in 1982. It was nominated for Oscars for Best Costume Design and Best Sound but lost to GANDHI and ET respectively. Apparently it wasn't nominated for an Oscar because the MPAA, in all its wisdom, thought the film-makers had cheated by using computers! This says a lot about how threatened the academy felt by new technology.